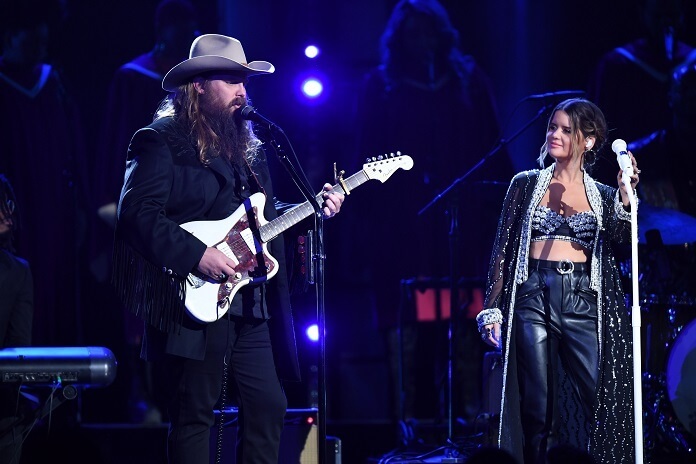 Chris Stapleton topped the list of winners at The 52nd Annual CMA Awards which were held on November 14, 2018 at the Bridgestone Arena in Nashville. Stapleton scooped up three wins, taking home trophies in the Song of the Year, Single of the Year, and Male Vocalist of the Year categories. The night’s other big winners included Brothers Osborne, Kenny Chesney, Luke Combs, Mac McAnally, David Lee Murphy, Kacey Musgraves, Old Dominion, Thomas Rhett, and Carrie Underwood. Keith Urban was named Entertainer of the Year. Carrie Underwood and Brad Paisley hosted the 2018 CMA Awards which kicked off with a tribute to the victims of the shooting in the Borderline Bar & Grill in Thousand Oaks. “Tonight’s show is lovingly dedicated to the 12 individuals whom we lost far too soon just a week ago tonight at the Borderline [Bar & Grill] in Thousand Oaks, California. Tonight let’s celebrate their lives, let the music unite us with love in their enduring memory, so please, join me now in a moment of silence,” said Garth Brooks. Hosts Underwood and Paisley also sent out a special thank you to the firefighters and first responders battling the fires raging in California.